Could any of you fine Commanders please tell me the upgrade range of the Droideka Sentinel and Oppressor that coincides with the HQ level? I have searched for older topics but can't find any info on the level tiers. 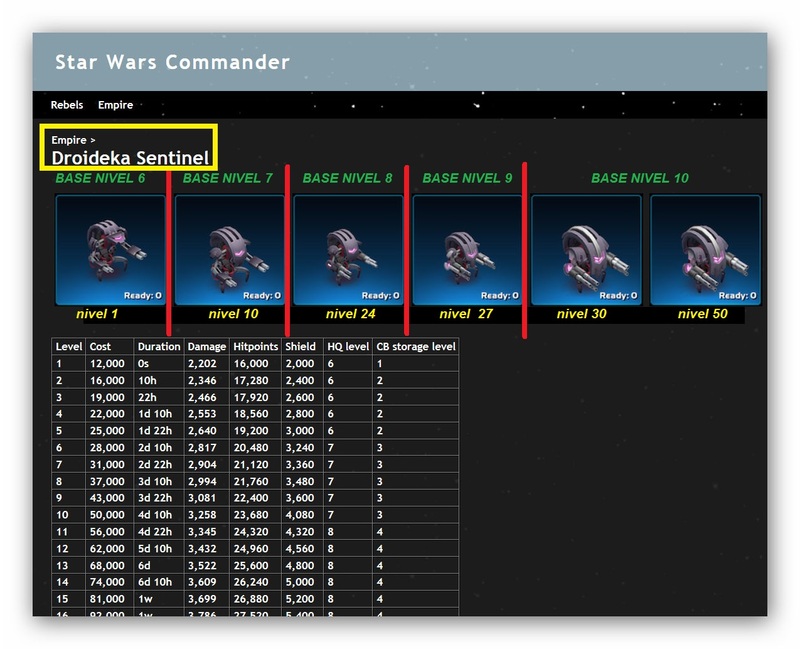 Itsatrap wrote: Could any of you fine Commanders please tell me the upgrade range of the Droideka Sentinel and Oppressor that coincides with the HQ level? I have searched for older topics but can't find any info on the level tiers. Itsatrap - You can find all the Droideka Sentinel / Droideka Oppressor Info here. - Need HQ 10 to level up CB safe house to L9. L8 CB safehouse can only contain up to 310K CBs, good enough for only Oppressor L20 and Sentinel L27. Information provided by Josketer was correct ! Probably a leftover from when L8 was the Max level, then 9 got added... and 10 and Prestige didn’t exist yet and were added beyond that. There was also an adjustment to the costs of the deka upgrades early on when people were able to upgrade too easily... that lasted about a whole 3-days or so before getting nerfed. Short upgrade times were hot fixed and the CB cost jumped up by 2.5-3x. Some players were able to jump from buying the deka to L10 in a few hours. I vaguely remember missing out on the lower costs/times because my droids were all busy while at work... The deka going to L10 was one of the first tangible hints that L9 was not the end. It was a long time ago, so don’t be too harsh if you remember it differently. The requirement for the Droideka Sentinel Level 50 needing HQ 9 is accurateper this "other" source found here. Yes I agree you need Level 10 in order to complete the "other" Upgrade Requirements but since HQ 9 is required starting with Level 34 and you need HQ 9 for HQ 10 the information is correct and changing it (from a Developer Point of View) for the higher levels would be moot. 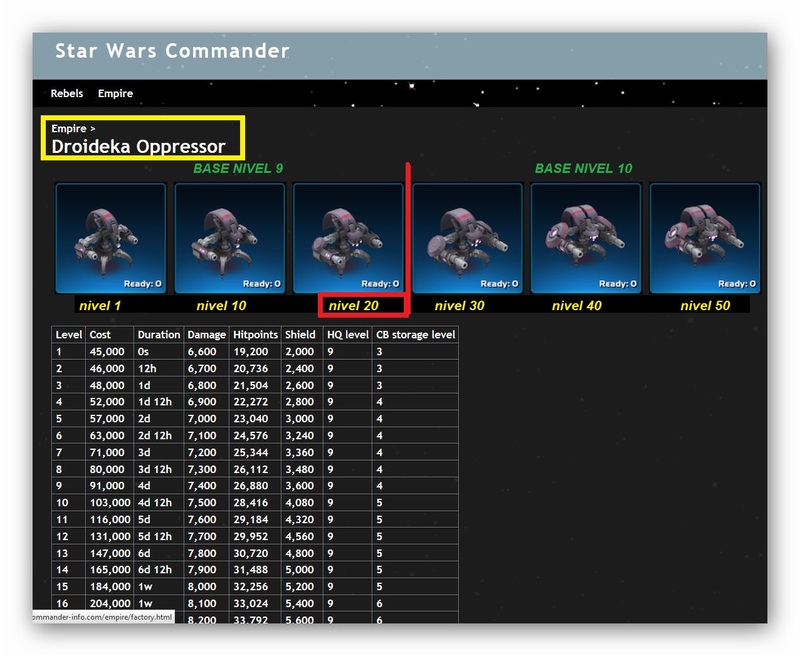 DeathStriker wrote: Itsatrap - You can find all the Droideka Sentinel / Droideka Oppressor Info here. That’s a bunch of crap, DS. DeathStriker wrote: The requirement for the Droideka Sentinel Level 50 needing HQ 9 is accurateper this "other" source found here. DarkRebel - I am uncertain of what concerns or issues you have with my Post as it is accurate based upon Game Data. You may be referring that in "reality" you need HQ 10 to upgrade DekA to Level 50, which I agree, but the "requirement" shown in the Game Data is HQ 9. That said, since you need to complete HQ 9 before you complete HQ 10, the Game Data is correct from one point of view, if not a bit confusing. Thanks for the info troops! An odd disparity in HQ level and CB needed. Good to understand it though. Always a dilemma to upgrade or not to upgrade a droideka. Kudos to whomever has upgraded their DekO to Level L. That fat Oppressor is boss. If you upgrade it, you lose it for a week and you lose a contruction droid too. If you dont, your droideka gets wrecked overnight anyway.